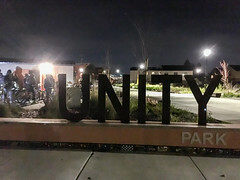 Everyone who's involved in cycling advocacy, especially in places like the Bay Area where advocacy has become powerful, must take the time to read and understand Adonia Lugo's Unsolicited Advice for Vision Zero, which challenges advocates to think about how their behaviors contribute to the identification of bike infrastructure with whiteness. Conflict amongst advocates over the Telegraph Avenue design in Temescal demonstrates the point. I just returned from a bike tour in Italy (wonderful! ), and was struck by the way the image of the bicycle is used. 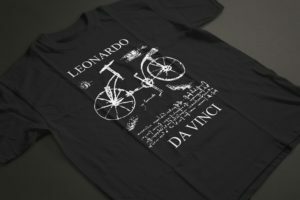 Perhaps the #1 t-shirt sold in tourist shops in Tuscany is a fake sketch of a bicycle supposedly drawn by Leonardo. I think the reason tourists buy that shirt is that the bicycle is relatable, and the drawing connects to their personal experience of travel. I think those shared experiences can help us develop shared understanding across cultural gaps. After Amazon finally decided who would win its HQ2 sweepstakes (psych! It's just two offices we were going to open anyway), there has been some talk about the pedestrian and bike improvements, particularly near the Crystal City site. 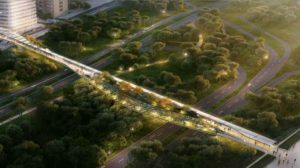 But comparing this quarter-mile airport corridor to the High Line is absurd, and Amazon should have to pay for it. This weekend I joined up with some folks from OakDOT at the Scraper Bike Team's "Pothole City" ride. I always want to take opportunities to learn about cycling cultures, and to visit parts of the city I don't know as well. And fortuitously, earlier in the week OakDOT had just approved a radical road diet project on 90th Avenue, based on the Scraper's preferred design. 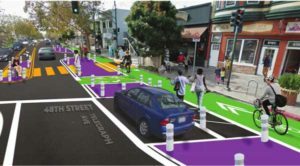 It involves a protected two-way bike lane running down the center of the road, painted orange, and potentially incorporating street murals. Part of my European trip involved a ferry to the island of Ischia, in southern Italy near Naples. 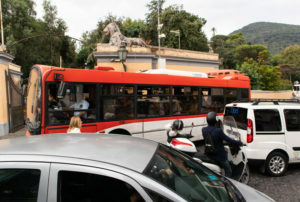 Like most southern European places, Ischia was built with an entirely different set of design principles than American cities, and it shows from the moment you step off the ferry, where the main street is one-fifth the size of the Embarcadero in San Francisco. 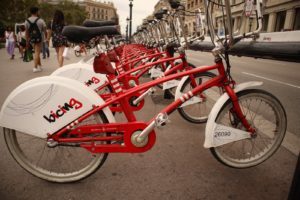 One of Adonia Lugo's criticisms of the U.S. bike advocacy movement is its focus on Northern European solutions, and implicitly, Northern European thinking and values. I happen to be traveling in southern Europe right now, where biking has a much different social meaning. Our first stop was in Barcelona, a city which urbanists love to talk about. One thing urbanists don't tend to mention is that cycling rates are fairly low; about 2% mode share, despite years of investment in infrastructure. Nakari from Rich City Rides posted this story of a black cyclist in Seaside Heights, NJ, getting handcuffed and arrested for obstruction of justice. The video doesn't show the beginning of the interaction, but the claim it makes (which I see no reason to dispute) is that he was stopped for not having a bell on his bike. No other explanation for the arrest is offered. 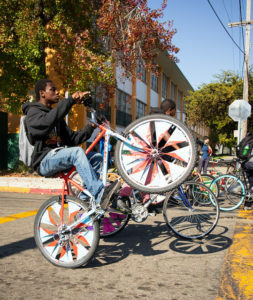 The biggest change to transportation in the Bay Area in the past year has been the adoption of dockless e-bikes, and most recently, e-scooters. 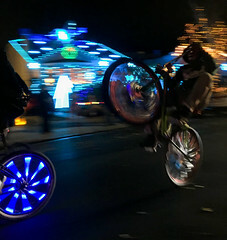 I rode both a Jump e-bike and a Lime scooter recently, which left me thinking about the implications for the city. 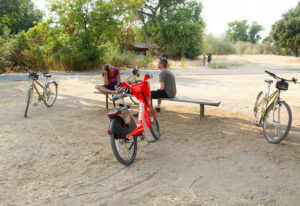 One thing that's notable is the demographic split between bike share and scooter share. 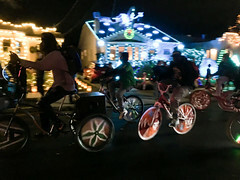 According to Motivate, over 75% of their riders are white, and while I haven't seen hard data on the scooters, it's pretty clear that in Oakland they are heavily used by people of color, especially kids. 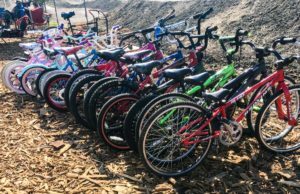 As an aspiring Marxist on Labor Day, I was reflecting on the relationship of cycling to worker organizations. 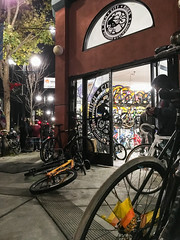 One of the findings of my field work is that almost every city has a worker-owned bike collective, and there are a ton of them here in the East Bay. 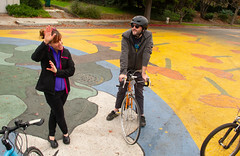 The programs offered by these co-ops tend to be community-oriented: social rides, earn-a-bike programs, bike education, and cheap or free repairs and used bikes. I'm wondering, what is it about the bicycle that activates people's interest in collectivism? I was glad to hear this week that the charges against Naj K. Smith for playing loud music from his bike were dismissed, thanks to the outcry from the community and the pro-bono work of Walter Riley. So the rally planned for today to protest his court date instead turned into a rally to discuss racial policing. 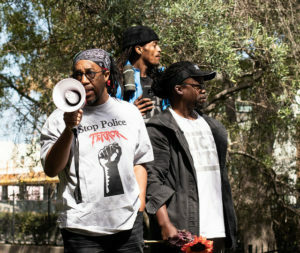 Speakers included Naj himself, as well as Oakland Councilmember Rebecca Kaplan (who also wrote a letter in support of Naj), and several folks from Red, Bike and Green, the organization Naj was leading the ride for when he got arrested. The general theme was that even though this particular case has been resolved, the structural problem of racially-biased policing remains.